When I first started chiseling stone in 1999, I fell in love with the medium immediately. I like the contrast of a stone’s harsh, cold exterior and the fact that you can create intimate ‘tactile’ statues with it. 2005 to current – Annually: Sculpting study & practice Pietrasanta, Italy. Ever since I was very young, I have been fascinated by nature and especially bird-life. Living in the Garden Route means that I’m close to both my passions. I have been collecting driftwood from the river estuaries and forests for about ten years now. Some pieces of wood are natural works of art. 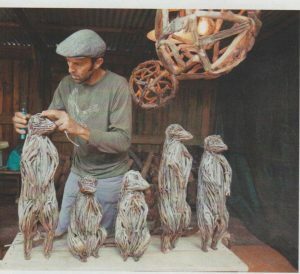 I assemble the driftwood, using only wooden dowels, and create birds, such as Blue Cranes, Eagles, Pelicans and Herons, several fish, and many other African animals. It’s amazing what you can build and create with Nature’s leftovers!